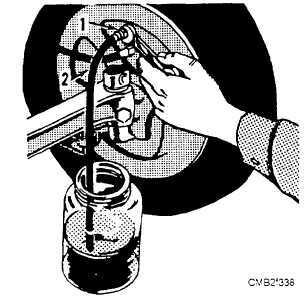 Attach a short length of a rubber hose to the wheel cylinder bleeder screw and allow the other end of the hose to be submerged in a jar halfway filled with brake fluid (fig. 7-37). Have an assistant push on the brake pedal to apply pressure on the brake system. It may be necessary to pump the brake six to seven times to build up pressure in the system. Open the bleeder screw while watching for air bubbles in the fluid located in the jar. Close the bleeder screw and tell your assistant to release the brake pedal. Repeat this procedure until no air bubbles come out of the hose. Bleed one wheel cylinder at a time. Do the one farthest away from the master cylinder first and work your way to the closest. This ensures that all the air possible can be removed at the first bleeding operation. It does not require an assistant. It maintains a constant pressure in the system. Figure 7-37. - Manual bleeding brake lines: (1) Bleeder screw: (2) Bleeder hose. Figure 7-38. 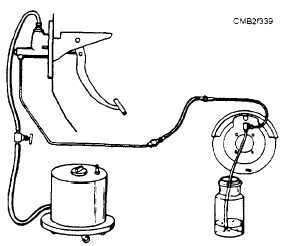 - Pressure bleeding a brake system. Pour enough brake fluid in the bleeder ball to reach the prescribed level. Charge the ball with 10 to 15 psi of air pressure. Fill the master cylinder with brake fluid. Install the adapter and hose on the master cylinder. Open the valve on the hose. A special pressure-bleeding adapter is required on master cylinders using a PLASTIC RESERVOIR. Use an adapter that seals over the ports in the bottom of the master cylinder. This will avoid possible reservoir damage. Attach a bleeder hose to the farthest wheel cylinder bleed screw. Submerge the free end of the hose in a glass container halfway filled with brake fluid. Loosen the bleed screw. When fluid coming from the submerged end of the hose is free of air bubbles, close off the bleed screw and remove the bleeder hose. Repeat bleeding operation on the other wheel cylinders in proper order. When the bleeding operation is completed, close the valve at the bleeder ball hose and disconnect the bleeder from the master cylinder. Check the brake fluid level in the reservoir, ensuring it is within 1/4 inch from the top and install the master cylinder cover. Q1. The time frame between the instant the operator decides to apply the brakes and the moment the brake system is activated is known by what term?